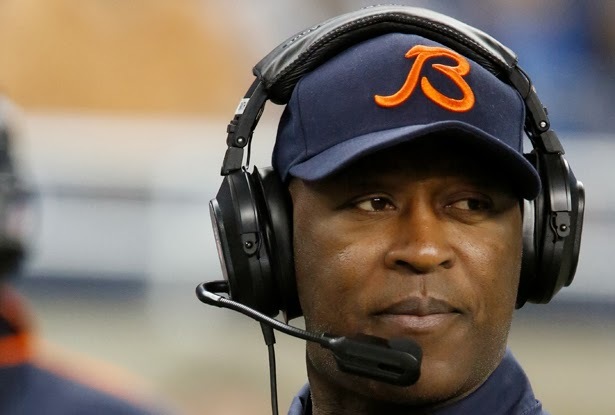 Lovie Smith reportedly will be one of the candidates interviewed by the Detroit Lions for the head coach opening. Others expected to be interviewed include Ken Whisenhunt, offensive coordinator for the San Diego Chargers, and Jim Caldwell, offensive coordinator for the Baltimore Ravens. 1. He knows the NFC North after serving as head coach for the Chicago Bears for nine seasons (2004-2012). He won the NFC North three times in nine seasons. 2. When he was hired by the Bears, he said he had three stated goals — beat the Packers, win the NFC North and win the Super Bowl. He came up short on winning the Super Bowl, but did get to Super Bowl XLI with Rex Grossman as his quarterback. He could dust off those same goals if he was hired in Detroit. 3. Smith and Lions general manager Martin Mayhew have a good personal relationship. They first worked together when Mayhew was a defensive back for the Tampa Bay Bucs and Smith was hired as the linebackers coach in 1996. 4. Smith’s experience as a head coach can’t be overstated. The Lions are loaded with talent, they need an experienced coach to make the necessary tweaks to make them a team that wins consistently. 5. Reportedly Smith, who will also interview for the Bucs' opening, will bring along Jeff Tedford as his offensive coordinator. Tedford is the coach who groomed Trent Dilfer and Aaron Rodgers, who are both Super Bowl winning quarterbacks. Tedford also coached four other first-round quarterback picks in college: David Carr (Fresno State), Akili Smith (Oregon), Joey Harrington (Oregon) and Kyle Boller (California). He was fired from Cal in 2012. Uhhhhhhhh.... That qb list is supposed to impress?!? !